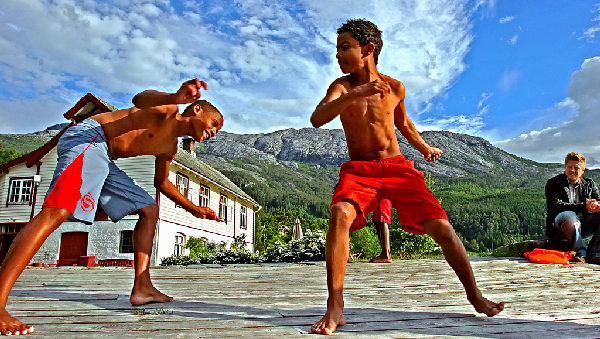 Brazilian boys dancing Capoeira in Norway. Photo: Children At Risk Foundation – CARF. Great podcasts opens windows to people’s lives through audio. What if you could hear these children’s voices, the music they are dancing to? In part three of this series on how to start travel podcasting, Craig Martin offers tips and tricks on content and tone. Along with Traveler’s Notebook editor David Miller, he also outlines a basic style guide for audio submissions to the Matador network. A personal, and sometimes informal tone differentiates most podcasts from commercial radio. As with any publication, it’s important to know your audience, and some of the most commonly-heard pieces of feedback Linda and I receive on the Indie Travel Podcast is that people appreciate our laid-back, informal style. Many podcasters use music to good effect. It adds lift and energy to your show. However it can be a annoyance if it’s too loud in comparison with your speech: make sure you balance it well. Too much or poorly mixed music (common mistake: the music is mixed too loudly) can be a serious deterrent to people listening to your show: people are more likely to skip the track rather than fast-forward through it. When using music during the show think about how it helps you communicate: linking, expanding, adding emotional value. Creating a theme for your show gives a professional touch and a familiar point of entry for listeners. This can either be taken from an existing song or, like the Amateur Traveler, custom made. A common added-value touch is introducing your audience to a new song or new band each episode. A popular marketplace for this is the Podshow Podsafe music network where, after registering your feed and details, you can listen to and download music with creative commons copyright licenses. Stock sound effects are available for download and use from numerous websites. When choosing them you may have to pay a download fee, but ensure that the sound is “royalty free”. This means you don’t need to pay each time you use it. When adding music to your show, think about the extra time it will take to produce the show and always respect copyright. The following style guide is aimed as a help for producing podcasts for the Matador Travel network. These are just the basics, however. Many points are worth considering when creating podcasts for other markets. Matador podcasts should be between two to five minutes in length. If you feel you need more time to treat a subject, please check with your editor beforehand. Thanks to syndication technologies, media portals and content theft you never know where your podcast is going to end up. Because of this we recommend beginning and ending each episode with your name, the episode title and a mention of the website you’re producing for. Whether you are creating an audio tour, a profile or a how-to, the Matador network aims to connect listeners to people, places, organizations, information, and opportunities that will affect positive change around the world. Make sure your podcast invites the listener to explore new places or communities and gives him or her the resources to do so. Matador is dedicated to promoting and protecting local communities and to drawing attention to issues threatening the health of their watersheds, ecosystems, and overall sustainability. Whenever appropriate, please give green and/or local options for transport, lodging, restaurants, activities, etc., and, if possible, celebrate positive changes taking place in the areas your are covering. Help us protect and preserve the places we visit. Above all, Matador is a community of travelers. Make sure you engage with us! Ryan Libre does a great job of this in his photography series by making us jealous of where he is whilst giving some background on the places he’s recording from. Produced by [your name] for [site URL]. This is part three in a series on beginning travel podcasting. Part one deals with hardware and software options, whilst part two gives tips for improving the quality of your recording. To hear some of Matador’s Podcasting talent, check out the Traveler’s Notebook podcast archive. Got something to add? Check out the submission guidelines then get in touch.